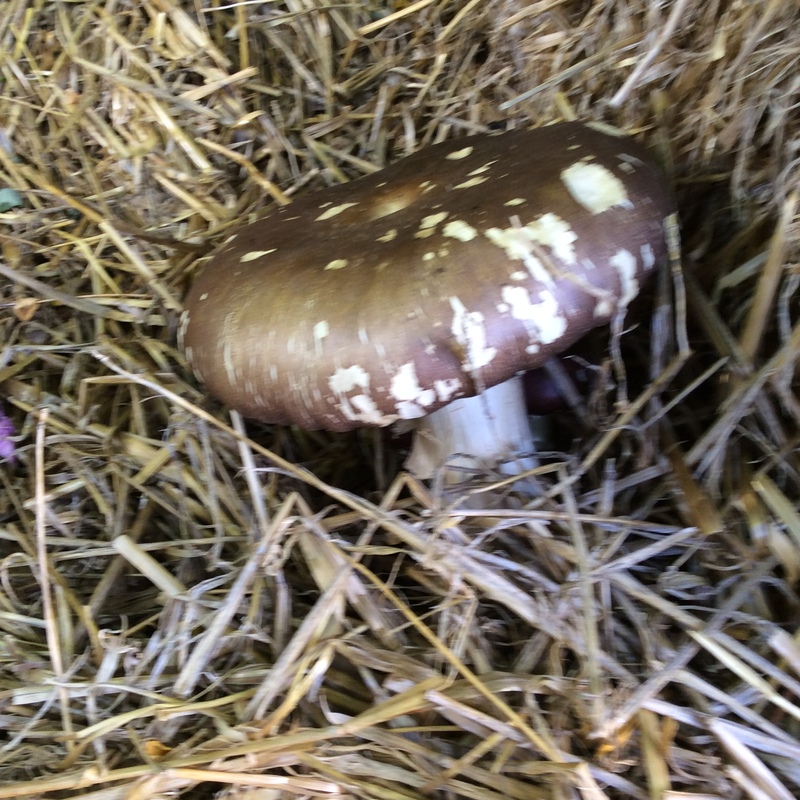 Early this spring I was putting down straw mulch around some new plantings in the shade and decided to order and incorporate some spawn for the winecap mushroom, Stropharia rugosa-annulata. I have never grown or tasted this mushroom before, and so I was very excited yesterday when a young friend pointed out “a giant mushroom” under one of the new little saplings. My first winecap was a healthy 6 1/2 inches in diameter. I cooked it plainly in butter with a little bit of salt, and it was perfectly nice but I would say not significantly better than store-bought cremini mushrooms. Still, my homegrown mushrooms are deep organic and came from my own land, so of course I favor them, and they benefit the soil and the growing plants as well as me. The advantage of Stropharia is that it is fairly rugged and easy to grow. I am told that it grows much better in deciduous wood chips than in straw, and at the very least I should have mixed in some deciduous wood chips or put some on top, but it is one of those things that I meant to get around to and haven’t done yet. Maybe I will still top up with some wood chips. 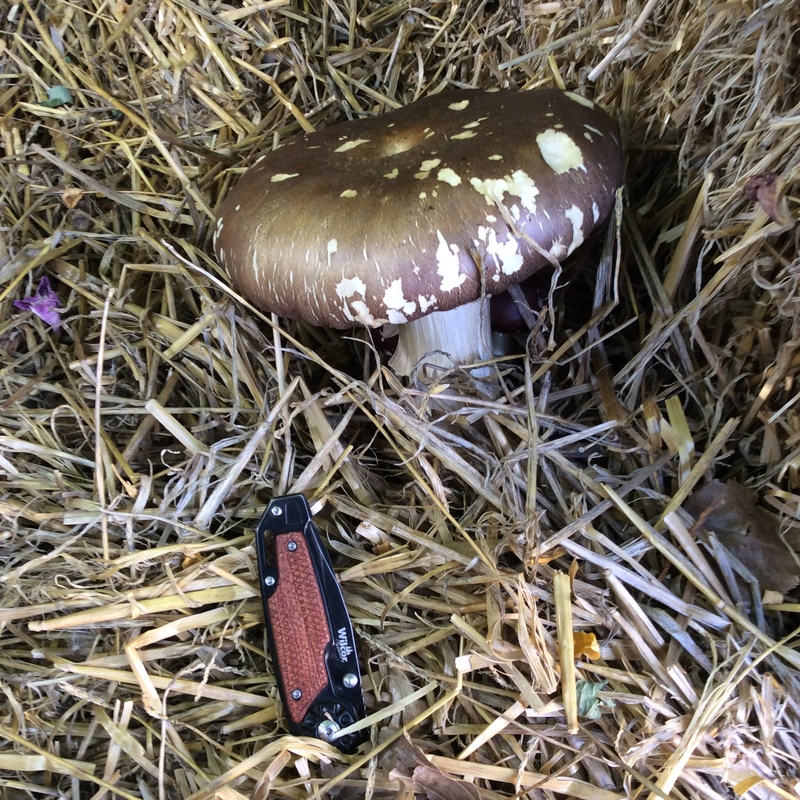 Here’s an important safety bulletin: just because you “planted” mushrooms in a specific spot, it is not safe to assume that any mushroom that comes up in that spot is what you planted. There is absolutely no substitute for knowing the identification points for the mushroom you planted as well as for any poisonous look-alikes. The mushrooms that I grow in my garden, oyster mushrooms and Stropharia, are easy to identify so this is not a difficult task.